They say that hindsight is 20/20. You can only know this if you’re willing to look back in order to move forward. Perspectives can create equilibrium or leave us shaky and in need of a change. My writing is a reflection of my process in doing just that. Life in process. Life in perspective. Welcome! You get the call from the school nurse one afternoon. Your child has a stomach ache and a temperature. Your instinct has you reaching for your keys to go pick her up, but then you pause. The nurse also called your ex because it’s his day to pick the kids up. “Fair enough,” you think. So you check in to make sure he’s received the message on his voicemail and learn that he’s asked his wife to go pick up your child. “Right, fair enough,” you think to yourself as your heart takes a hit. “But I want to be there.” You’re reminded of how you don’t get to be there anymore in all the ways you once could. This is the quiet ache of many divorced parents, moms and dads alike. 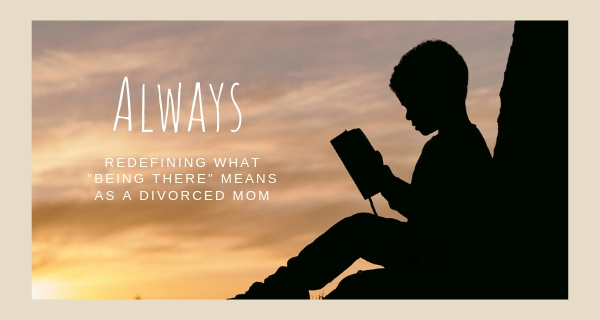 It’s one that I am all too familiar with–of the ongoing struggle to keep reconciling oneself to the turns that life has taken and the heartache of having to let your children go over and over and over again. We don’t get to be there whenever our kids are sick. We don’t always get to see them on their birthday. We don’t get to love on our kids whenever they have a stomach ache and take their temperature and ask if they want some chicken soup. It’s an empty-nest syndrome that comes far too early for divorced parents who must grapple with how to feel connected with their children and present even when they are physically in a different place. A familiar adage comes to mind: children don’t keep. Indeed, they do not. They grow up; they move out; and they build their own lives. For divorced parents sharing custody or without any custody at all, this experience comes too soon. It’s not without saying that I’ve had to redefine for myself what being there for my children means, or else I risk living in a state of perpetual heart sickness. Being there means always I am with them in spirit. When they’re sick, I’ll always say a prayer. When we’re apart, I will think of them. I will always hold them close at heart. I will give them the best human version of divine love I can, with a promise to love them no matter what–when they’re doing well in school and when they’re not; when they try my patience; when they make me proud; when they disappoint me. Being there means doing my best to be fully present when they are with me. Being there means I will seek their best even when it comes at a cost to my own heart. This is how I have redefined what “being there” means. And if there is any comfort to be found as I let them go it is that I will always, always, be their mom. Whether it’s an ex or an ex-friend, we’re all probably tempted and at some point have wandered into the vortex of unsettled curiosities. Where is so-and-so? What happened to whosy-whats-it and whats-his-name? But to what end? In most cases, our interest is relatively benign, leading to amusement or relief. In the case of life after divorce, however, those energies are better directed to exploring something new and uncharted, not stewing over your ex’s whereabouts and whatnots. There comes a point in the great beyond, not the cybersphere but, instead the great beyond that is one’s life after divorce, in which one must consciously sever ties with those curiosities. Because, after all, you can’t let go when you’re still holding on. Rabbit trails lead to potholes which lead to booby traps and sprained ankles. Nothing good comes from it. Let it go. Do whatever you need to close the door, so you can move on. Block them. Block yourself. Just turn it off and step away from the laptop! But seriously . . .
Channel your energies toward your future, your friends, your own family. It’s an exercise in self-control, but you’ll never regret those unexplored indulgences. Peeking into someone else’s future only mires you in your past. Because, as I said already, you can’t let go when you’re still holding on. The last time I cried like this was when I was six years old, sitting on the front steps of the home we were moving away from in Buenos Aires, Argentina. Even at such a young age, the thought of leaving my best friend, Eva, left me grief-stricken. I don’t think I’ve cried that hard over a goodbye until this week. On Sunday, one of my dearest friends and her family gathered with mine for a final meal together before their move this week to the west coast. I made the cocktails a little stronger than usual, and we relaxed for a few minutes on the deck while the kids ran wild through the house. All the while, in the back of my mind, I knew the time for goodbyes was at hand. For the past couple of months, every encounter with this special friend has felt like a countdown of sorts, as I anticipated her departure this week. And finally, as reality set in that there isn’t a date on the calendar for the next lunch date or impromptu sleepover, the tears came. And they kept on coming. I felt like I was six again. I’ve said plenty of other goodbyes over the years, but none quite like this one. As I lamented each thing I won’t be able to share with this friend on a regular basis, I was filled with gratitude for everything she has been to me, especially in the years since the end of my marriage. Six years ago this summer, she welcomed me back to Maryland in my newfound singledom. Months earlier, I’d moved to the west coast myself only to learn that my marriage was over. When I arrived back home in Maryland, she drove to my old townhome with me and helped me paint the walls of the bedroom that would this time be just mine. When I recall the milestones of the last several years, she was there for nearly all of them—-my divorce, my first Christmas following, my 40th birthday, my second wedding, and the launch party for my book. We’ve logged a few road trips and countless soulful conversations. I love her so very much. What I was reminded of as the tears washed over me was, once again, that grief begets grief. We can be chugging along, reciting the mantra, “fine, fine, everything’s fine,” and then wham! A fresh loss feels like a semi just hit. It’s as if our tears leave old wounds raw, exposing unresolved hurts and memories of past heartbreak. So it was good, that as I lamented the depth of the loss, I could not ignore the profound gratitude to have had such a friend whose absence I am grieving deeply. And thankfully, she’s just going to the other side of the country. All has not been lost. There will indeed be an opportunity to reconnect somewhere down the road. A few weeks ago, we shared one last dinner without our families. After we paid the bill and said goodbye, we each headed to our respective parking garages, thinking we’d be heading in opposite directions. Yet, there we were, waiting for the light at the crosswalk to head in the same direction. Amused, she made a comment, and I followed up saying it felt like a metaphor for something. And that’s where I’ll leave it. We’re veering off for a bit. But ultimately, my sweet friend, we are heading in the same direction.